Pastor Kong took the stage and led the people into worship. The Presence of God was beautiful beyond description as people held hands and prayed. After worship, it was baby dedication. Tithes – Leviticus 27:30 30 And all the tithe of the land, whether of the seed of the land, or of the fruit of the tree, is the Lord’s: it is holy unto the Lord. 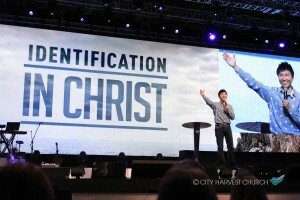 After the offering, he shared the Sermon on “Identification with Christ“. He mentioned about Paul’s encounter with God on the way to Damascus, that changed his life. He became Paul from Saul. Paul called himself as “A man in Christ”. Paul rose to eminence due to abundance of revelation. The first 4 books of the New Testament is the proclamation of the Gospel. The book of Acts is the demonstration of the Gospel. But the writings of Paul were the explanation of the Gospel. Paul saw behind the screens. The center of our Faith is the death, burial and resurrection of Jesus Christ. If you know your location, you will know your destiny mentioned Pastor Kong. Before Jesus ascended to heaven, He told His disciples to go into all the world and preach the Gospel. Everything Jesus did, He did for you. Jesus gets all the Glory but we are the ones who are benefited. The reason we are powerful is due to death, burial and resurrection of Jesus Christ. Paul used the term “in Christ”, “in Him”, “in Whom” 140 times in the scriptures. In Christ means united with Him, in union with Him. With speaks of identification. There are 7 areas to identify ourselves with Christ. We are crucified with Christ. 2 Corinthians 5:17 17 Therefore if any man be in Christ, he is a new creature: old things are passed away; behold, all things are become new. Romans 6:6 6 Knowing this, that our old man is crucified with him, that the body of sin might be destroyed, that henceforth we should not serve sin. We died with Christ. On the cross, Jesus became a substitute for us. There is no more judgement for us. 2 Corinthians 5:21 21 For he hath made him to be sin for us, who knew no sin; that we might be made the righteousness of God in him. Isaiah 53:5-6 5 But he was wounded for our transgressions, he was bruised for our iniquities: the chastisement of our peace was upon him; and with his stripes we are healed. 6 All we like sheep have gone astray; we have turned every one to his own way; and the Lord hath laid on him the iniquity of us all. Every sickness came upon Jesus on the Cross. God allowed poverty to come on Jesus on the Cross. Jesus not only bore our sin but also curse. Mark 15:34 34 And at the ninth hour Jesus cried with a loud voice, saying, Eloi, Eloi, lama sabachthani? which is, being interpreted, My God, my God, why hast thou forsaken me? We are buried with Christ. Psalm 88:4-9 depicts Christ on the Cross4 I am counted with them that go down into the pit: I am as a man that hath no strength:5 Free among the dead, like the slain that lie in the grave, whom thou rememberest no more: and they are cut off from thy hand.6 Thou hast laid me in the lowest pit, in darkness, in the deeps.7 Thy wrath lieth hard upon me, and thou hast afflicted me with all thy waves. Selah.8 Thou hast put away mine acquaintance far from me; thou hast made me an abomination unto them: I am shut up, and I cannot come forth.9 Mine eye mourneth by reason of affliction: Lord, I have called daily upon thee, I have stretched out my hands unto thee. 2 Corinthians 5:21 21 For he hath made him to be sin for us, who knew no sin; that we might be made the righteousness of God in him. 2 Corinthians 5:14-17 14 For the love of Christ constraineth us; because we thus judge, that if one died for all, then were all dead:15 And that he died for all, that they which live should not henceforth live unto themselves, but unto him which died for them, and rose again. 16 Wherefore henceforth know we no man after the flesh: yea, though we have known Christ after the flesh, yet now henceforth know we him no more. 17 Therefore if any man be in Christ, he is a new creature: old things are passed away; behold, all things are become new. When God looks at Jesus, He sees us, God sees us Righteous. Does that mean we are perfect? No. It means we should not be sin conscious. Not to be sin conscious does not mean we can continue to sin. Jesus is not the fire escape, said Pastor Kong. 1John 1:9 9 If we confess our sins, he is faithful and just to forgive us our sins, and to cleanse us from all unrighteousness. God cannot bless unless you ask Him. After the sermon, Pastor Kong led the people into worship. The Anointing was awesome as people prayed for one another. Under the anointing, he rebuked the evil spirits and prayed for healing, deliverance and financial miracle. The service finally ended with a beautiful praise song.